Like a duck gliding slowly, wings spread wide, feet reaching for landing on a pond, we are coming to the end of an incredibly fast harvest. Last week we saw extreme temperatures. Extreme cold in the mid 40s and extreme heat in the mid 90s. I have seen some vineyards in Calistoga with frost damage at this point and that only reconfirms my belief that the season is coming to a close. We have about a week an a half left of harvest at the winery to bring in all the remaining fruit. It is mostly Bordeaux varieties with one lone block of Chardonnay down in Carneros that routinely takes its sweet time ripening. The theme of this year has been low extractability. We are having to work extremely hard to extract what color and flavors are in the skins. Maybe that is a result of the drought. Maybe the skins are thicker and harder due to the lack of water. However, this was not the case last year which was also a drought year. Quality looks good. We are just having to work harder to keep it than in 2013. It also seems to be a year of slow yeast. Very few fermentations are “finishing strongly” with most going well until 3 or 4 Brix then slowing down to a crawl to the finish line. For myself, I’ve signed up for a 10K on November 9th in Calistoga. I wanted something to look forward to and work towards now that the Master of Wine program is no longer in my life. Personally, I really can’t stand running. I much prefer dancing, Pilates, Yoga, or even biking to running. However, if I want to push myself I can’t stick with the easy stuff. I have to motivate myself to do it. Unfortunately my training has been hindered by an fateful run in with a tick sometime last month and fighting the resulting infection that may potentially be Lyme disease. Why am I posting this? One, if one person who reads this blog remembers to check for the beastly buggers after wandering around in the outdoors it was worth it. Two, I believe in being open, honest, and fully authentic. In this blog I’m not only writing about wine and winemaking but also its affect on my life. Fortunately and unfortunately, one of the requirements of the job is being outdoors much of the year with all the highs and lows that come with that. I’m under good care and well on my way to making a full recovery however prayers are always appreciated! 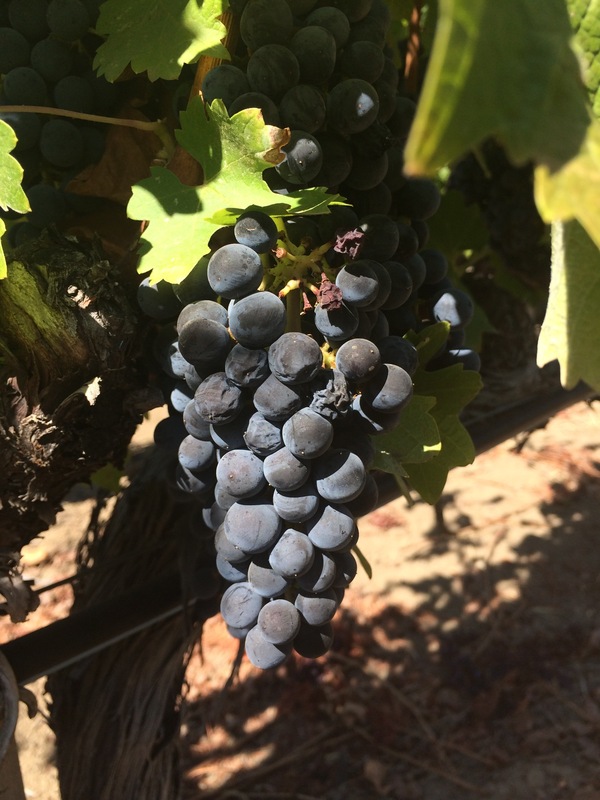 Harvest 2014: Week 9 – So Where Are We Going to Put That? After the events of last week, my thoughts are that we are pretty much finished with the normal ripening process for this harvest. We had another rain storm that dropped an additional 1/2 in of rain on Calistoga and thunderstorms on Friday that brought a massive hail storm and lightning to the valley. Luckily it doesn’t seem that any fruit was severely damaged from the hail but all the moisture in the air has started to take its toll and some of the green mold that comes with rain is starting to show up. The canopies look tired and the vines have fully lignified signaling their start towards dormancy. When one looks around the valley more often than not the vineyards are picked now and slowly turning to the beautiful yellow of fall. Harvest now becomes a logistics game. Who has tanks? Who has crews to pick? Who has trucks to haul the fruit if the first two questions are met with answers. With the rain during week 7, some of the high Brix that we had been seeing went backwards a bit so we aren’t going to be seeing the incredibly high brix harvest that I had feared. Flavor concentration still looks good so that is a blessing. I couldn’t help but think about anyone doing dessert wines because I bet this year would be stellar for botrytis and combined with the ripe fruit concentration that was reached before the rain, it has the potential to be a fantastic year for desserts. I’ll have to reach out to my winemaking buddy and dessert specialist, Roger Harrison, to get his take on it. Some growers are already seeing the end to their season while for the rest the end is almost in sight. I can see the light at the end of the tunnel and barring any major fermentation issues this harvest should wrap up smoothly and very early. Harvest 2014: Week 8 – What Do Harvest and Home Renovation Have in Common? At home we are still working on our Master Bathroom. The drywall is going up today and tomorrow and the tile installation will start on Friday. It is going to be great but with our hard work over the weekend it got me thinking about the ways that both home installation and harvest are similar. 1) Both are weather dependent. The moisture in the air causes drywall mud to cure more slowly as well as thin set on tile so it slows down the process even if it is dry in the house. Same is true of moisture with harvest. Rain brings harvest to a halt completely and excess moisture slows down the ripening process and can cause rot (luckily we haven’t seen any major issues this year!). 2) Both feel like they take FOREVER! When you are in the midst of a crazy project or harvest it seems like it has been going on a LONG time and the end is no where in sight. 3) But when they are over you look back and think “That wasn’t so bad.” It seems like such a fun thing in hindsight that you forget the lost sleep, the setbacks, the sluggish tanks, the blown reno budget, and just appreciate what all your hard work has given you. Amazing wine and hopefully an amazing bathroom! 4) Both are super exciting to plan. I love picking out tile and vanities. I also love selecting the next blocks and putting them on the schedule. It is the best feeling in the world when you have a tank that stubbornly doesn’t want to finish fermentation yet you are somehow able to coax the yeast out of their funk and get it to go dry. There is no better feeling than that! 5) Both need the little wins celebrated. When we finished the demo of the bathroom this weekend it was a mess. I HATE drywall dust. Seriously! However, as my husband and I were sweeping it all up I realized that we had reached a critical point in our project. The point where you stop tearing apart and start putting back together. At this point, we are over 50% finished with the fruit that is scheduled to come into the winery. That is also a tipping point. We have started down the home stretch and while it seems like it will be a dramatic finish with the high sugars and the early rains, there is a light at the end of the tunnel now. As to the rains, I welcome them. We desperately need them. We need rain more than we need a stellar vintage right now however I definitely don’t think these few small rainstorms will have a detrimental effect at this point. We are not looking at another 2011 simply because in 2011 we were struggling to reach 24 Brix. This year it seems like we will be very lucky if our average Brix stays at 26-27. We could use some more hang time so bring on the cool weather and the rain! The Cabernet can take it!